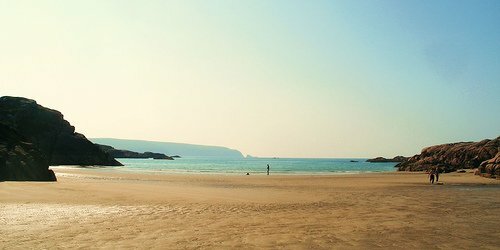 Beautiful bays and deserted sandy beaches indent the rugged coastline. Magnificent mountains create a natural wilderness and haven for deer, fox and other wildlife. 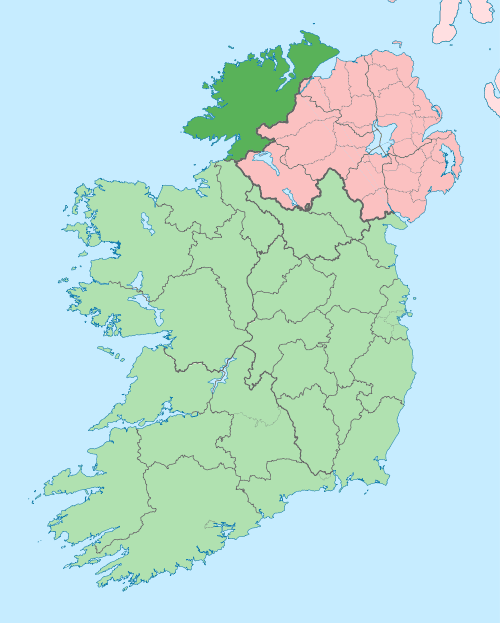 County Donegal is Ireland’s most northerly county although it is part of the southern Republic of Ireland. 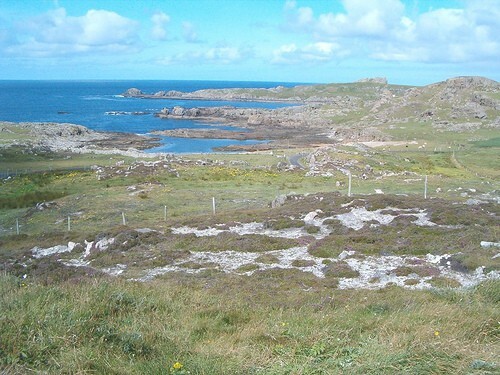 Malin Head, on the tip of the Inishowen peninsula, is Ireland’s most northerly point. 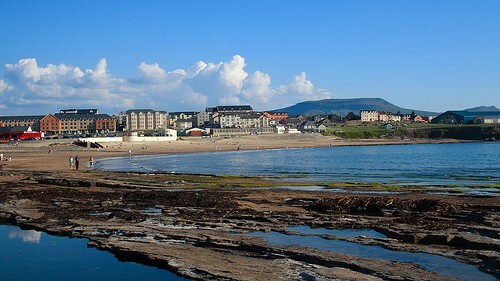 Bundoran is a family resort town in the shadow of Ben Bulben, with breathtaking views of Donegal Bay. It has emerged in recent years as an excellent destination for surfers and those seeking outdoor activities. 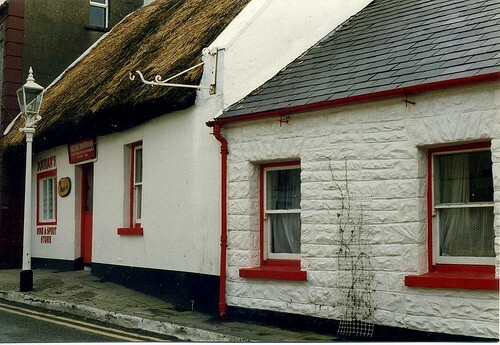 Ballyshannon, the oldest town in Ireland, is surrounded by history and is known as the gateway to Donegal. Rory Gallagher, one of the world’s greatest guitarists ever, was born here. Ballyshannon Folk and Traditional Music Festival is the place to be in early August. 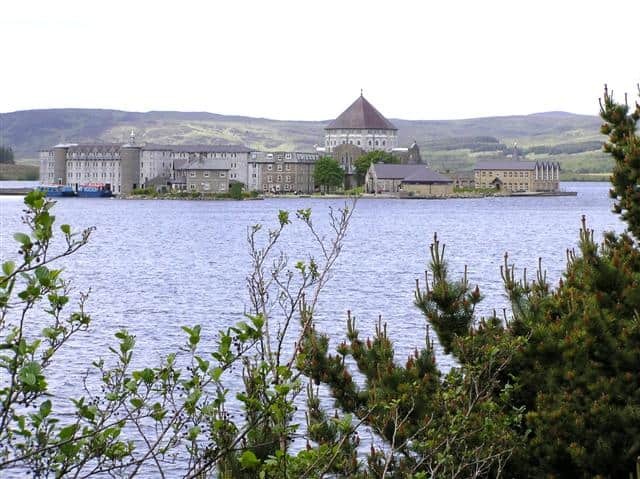 St. Patrick’s Purgatory is an island in the middle of Lough Derg near the town of Pettigo. 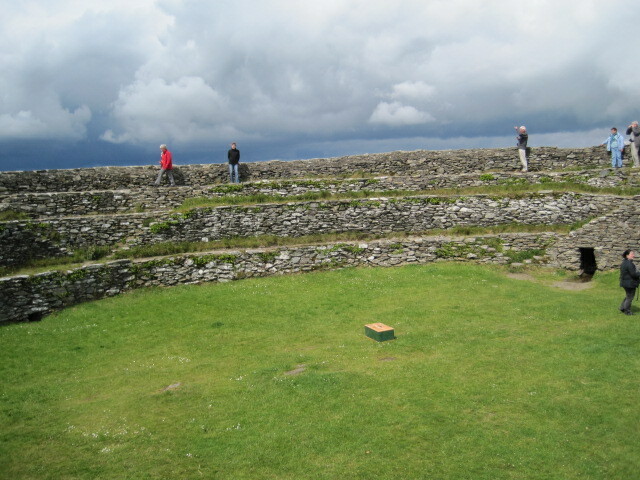 Since the Middle Ages this island has been a spiritual sanctuary and place of renewal. A traditional three-day pilgrimage involves fasting on bread and water, walking barefoot and a 24-hour sleepless vigil. As a teenager worried about my Leaving Certificate (the Irish equivalent of the SAT’s) I visited Lough Derg and prayed for guidance from above. 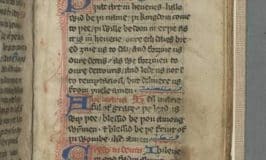 I returned through my college years repenting my lack of diligent study and praying for a satisfactory outcome in my annual finals. Mercifully, my prayers were answered, even if I never managed not to snooze at some point during the vigil. 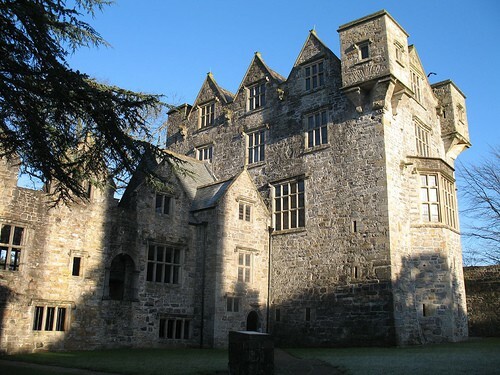 Donegal Castle is the seat of the famous O’Donnell clan, a last name which is still very common in the county to this very day. Open to visitors, guided tours are available with a nominal entrance fee. At this writing the family charge is only €10, a bargain for a family of six like mine. Donegal town center is known as “The Diamond” and is a popular area for tourists to enjoy music and other social gatherings. 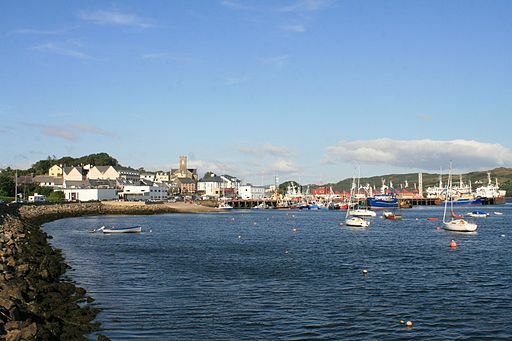 Killybegs is one of the busiest fishing harbors in Ireland. Upon first approaching the town by car, your nose will confirm the primary industry is fishing. Boats roll and sway across the waves as they make their way in and out of the harbor observed by many local seals. The Slieve League Cliffs lie west of Killybegs and are just under 2000 feet high, almost three times the height of the more famous Cliffs of Moher in County Clare. These ocean cliffs are amongst the highest in Europe. 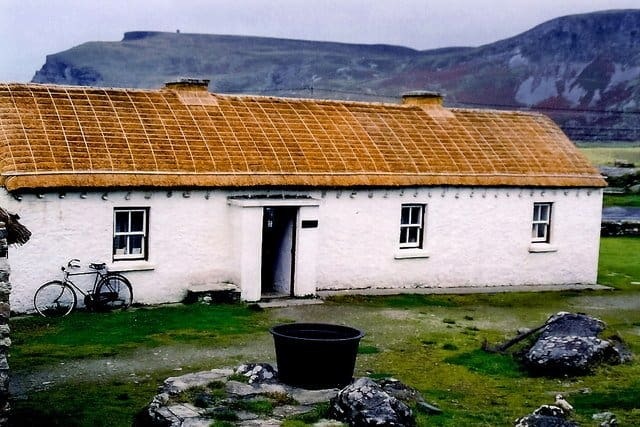 The picturesque village of Glencolumbcille is home to a folk village where different buildings are representative of a local dwelling from the 18th, 19th and 20th centuries. A winding mountain road leads through the Glengesh Pass from Glencolumbcille to Ardara. Hairpin bends around steeply plunging slopes are not for the faint-hearted behind the wheel. 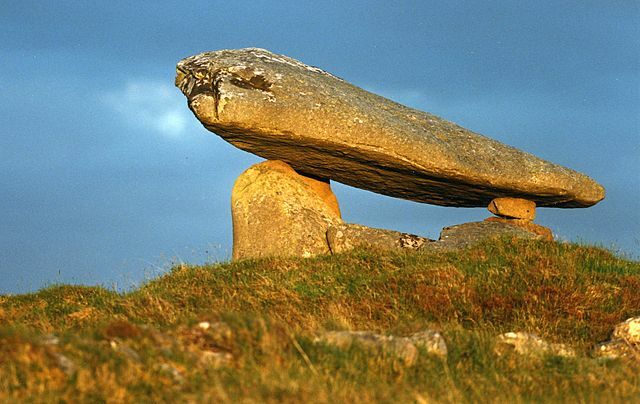 The Kilclooney Dolmen is 4000 years old and can be seen on the mountain skyline from the village of Ardara . 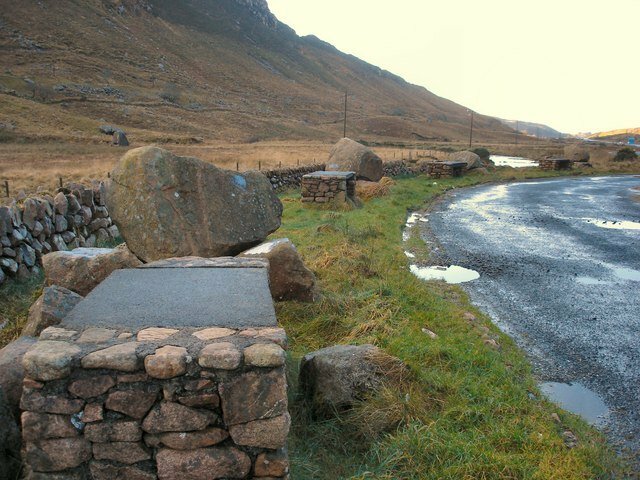 The Barnesmore Gap winds between the rugged and gaunt peaks of the Bluestack mountains linking Donegal town to Ballybofey in the eastern county. 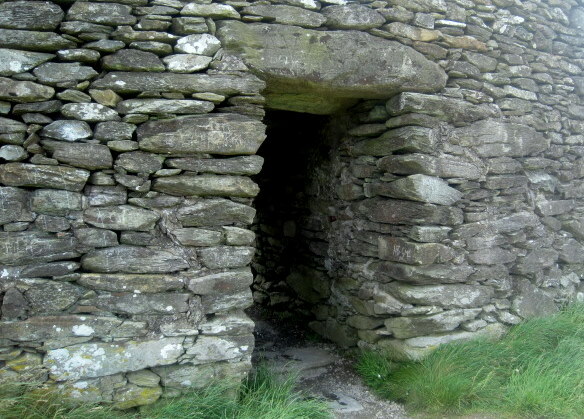 Before 1800 it was a notorious hang out for highwaymen and brigands, making a trip northwards through the interior of Donegal a dangerous undertaking. 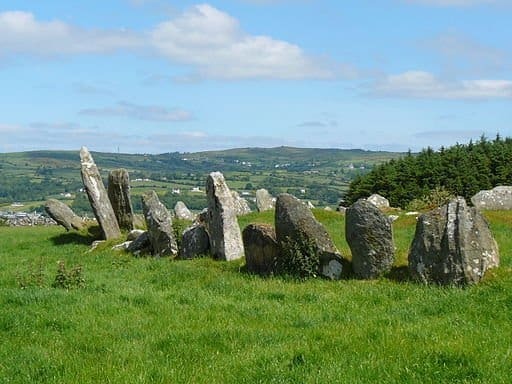 Near the village of Raphoe stands the ancient Beltany Stone Circle. It’s name is dervied from the Gaelic term ‘Bealtaine’ or May and one of the stones is aligned to point towards sunrise on May Day. 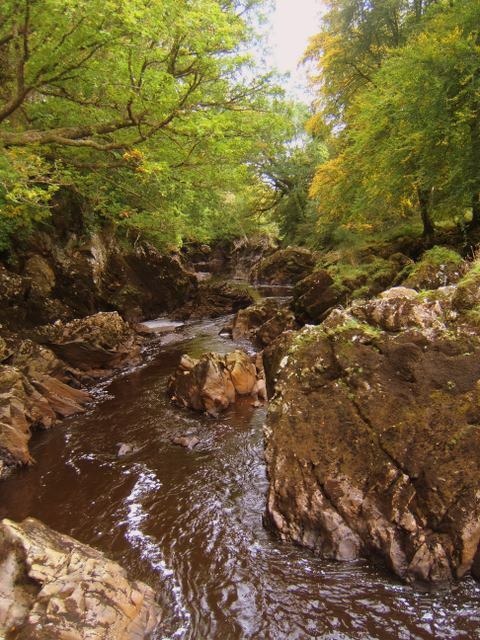 The River Finn rises in Donegal and flows eastwards towards County Tyrone. 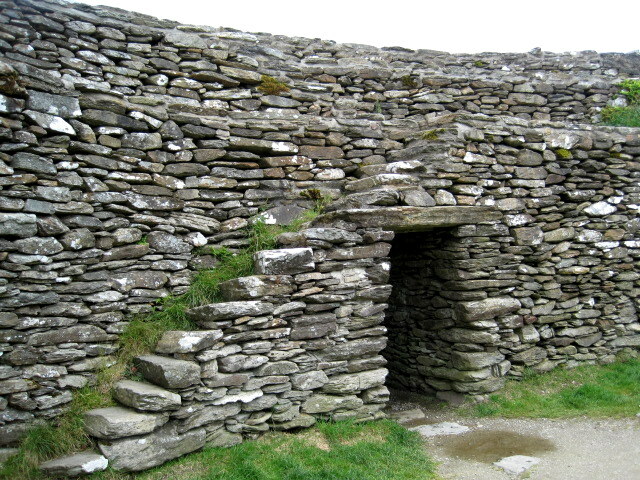 The salmon leap pictured above is located near the village of Brockagh. 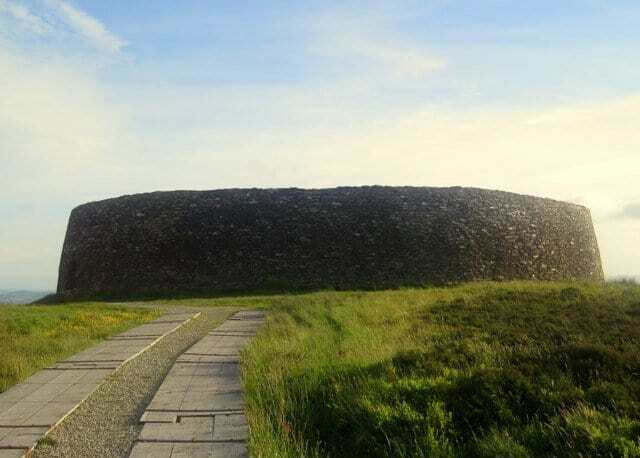 Letterkenny is the largest town in Donegal and is a perfect base for exploring the county. 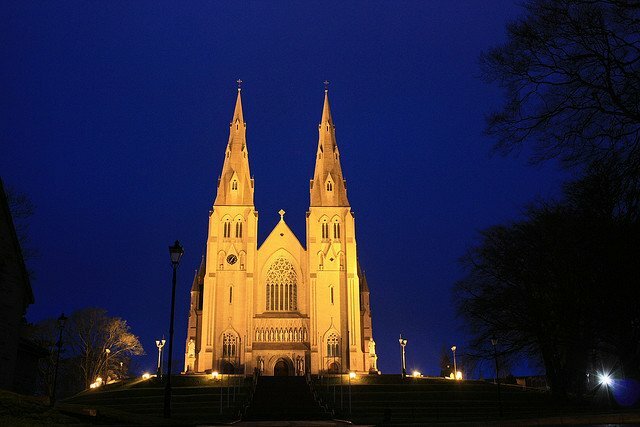 The town’s skyline is dominated by St. Eunan’s Cathedral which was built between 1890 and 1900. 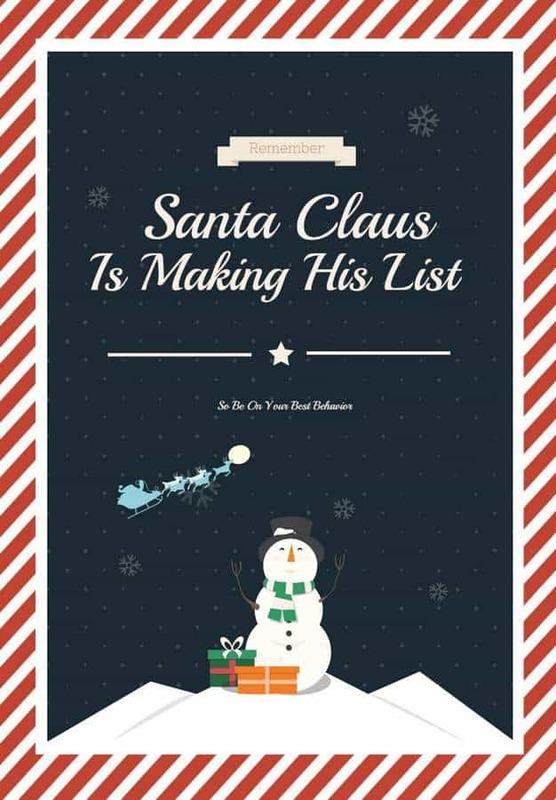 Tourists can choose from a wide variety of hotels, guesthouses, cafes and restaurants. The town is home to a beautiful new theatre. 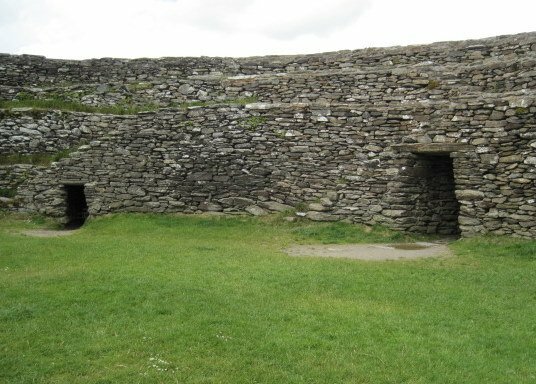 An Grianan is a 383-seat arts and entertainment venue, offering a wonderful variety of events throughout the year. Beautiful views of Lough Swilly surround Letterkenny town. 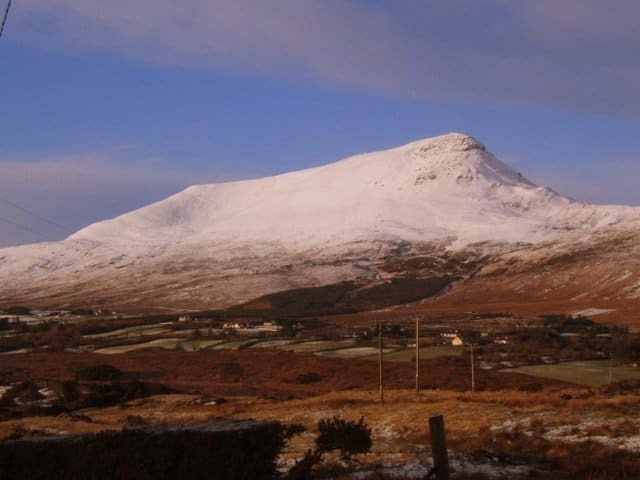 Muckish mountain lies northwest of Letterkenny in the Derryveagh mountains. It’s name is derived from the Irish word ‘muc’ meaning pig. It’s distinctive flat top is said to be like a pig’s back. 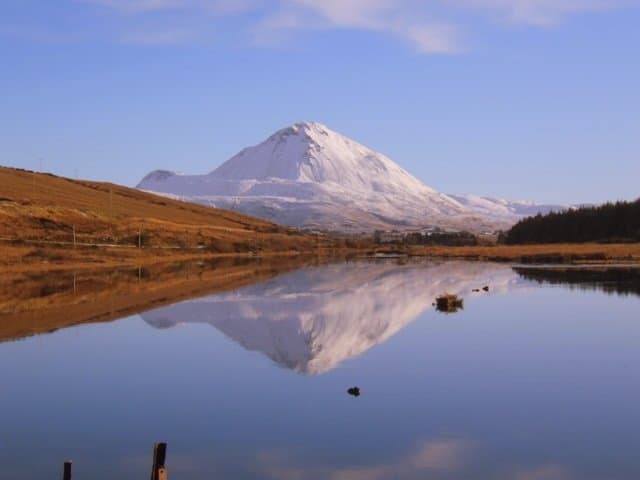 Traveling further west lies Mount Errigal, Donegal’s highest peak. The photo above was taken in the winter of 2010 when Ireland was blanketed in snow. 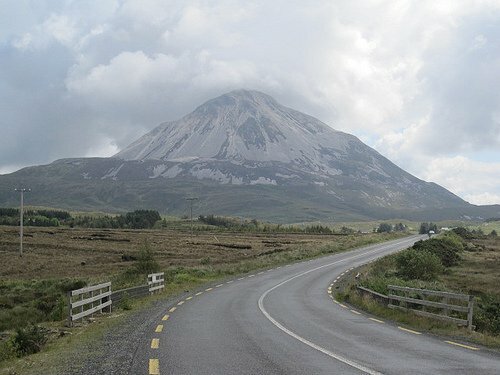 Here is Errigal’s granite peak in the gray skies of an Irish summer. A path leads along the southeast ridge to the summit and can be climbed in just over an hour. On a sunny day the views from the top are spectacular. 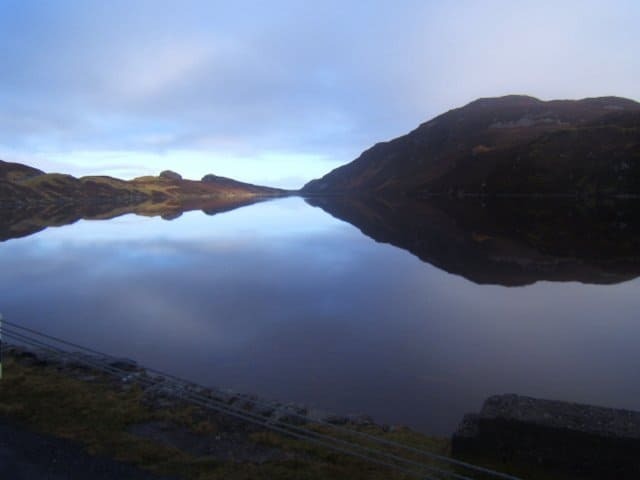 This reflective lake lies in the Derryveagh mountain range. 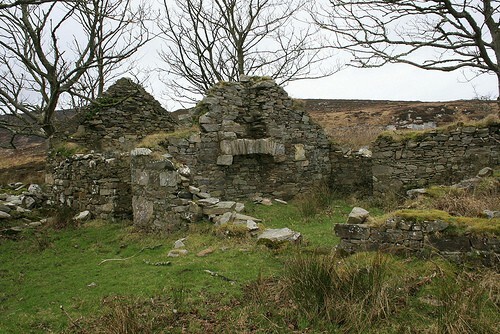 Ruins of old stone cottages are dotted throughout the Donegal countryside. 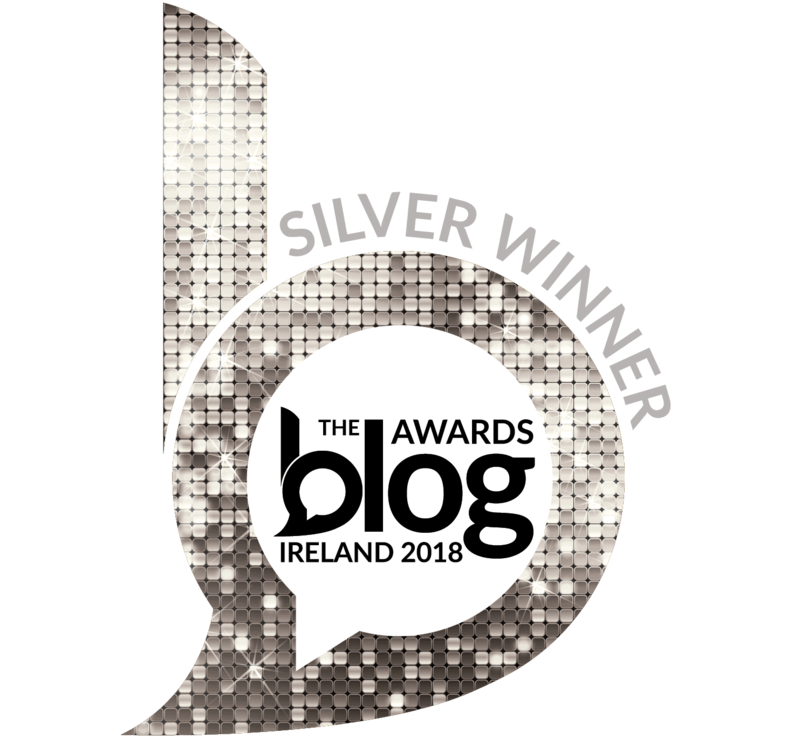 Most were abandoned at the time of the Great Famine when poor tenant farmers were evicted from their homes, forced to emigrate or simply died by the side of the road. 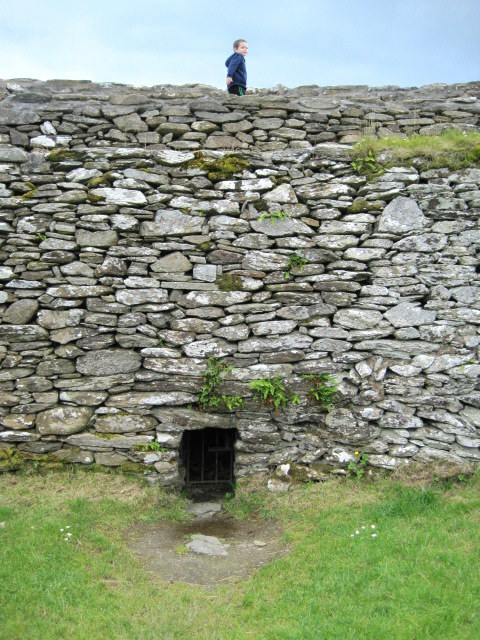 In Ireland it is thought to bring bad luck to demolish an old dwelling where the spirits of former inhabitants may still linger. These ruins now stand as an eerie memorial to our forefathers. 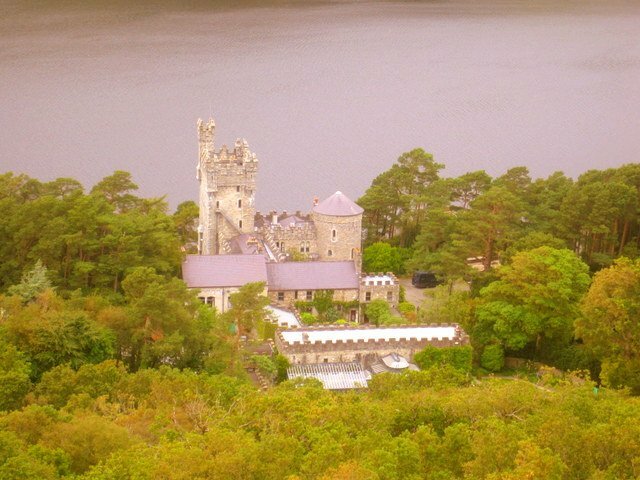 Glenveagh Castle is nestled in a desolate and hauntingly beautiful valley, overlooking a steely gray lake. The national park and castle are open to the public and well worth a visit. Beautiful gardens and parklands await and for those willing to undertake a stiff climb, breathtaking scenery awaits. On the western coast of Donegal lies the picturesque town of Dungloe which hosts the popular festival Mary From Dungloe each summer. 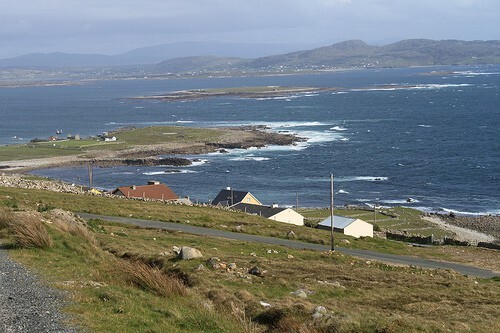 Arranmore is the largest inhabited island off the coast of Ireland and Donegal. Car ferries leave from Burtonport. 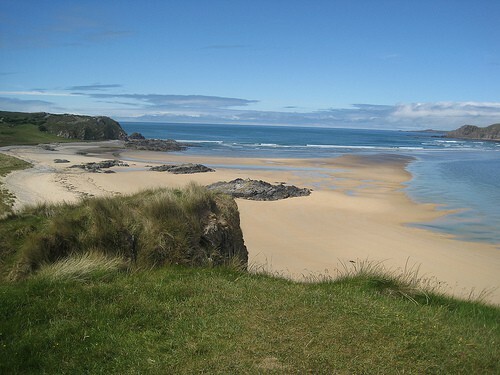 In the northwest of Donegal Irish is the predominant language and the area is part of ‘The Gaeltacht’. Don’t worry! The locals speak English too and love to chat with tourists. 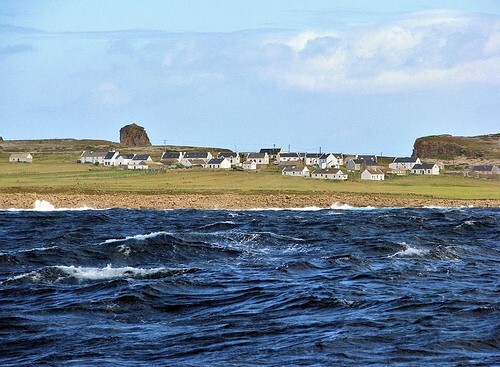 Tory is the most northerly inhabited island off the coast of Ireland, exposed to the full fury of the North Atlantic ocean. Like its southerly neighbor Arranmore, it is also accessible by ferry. 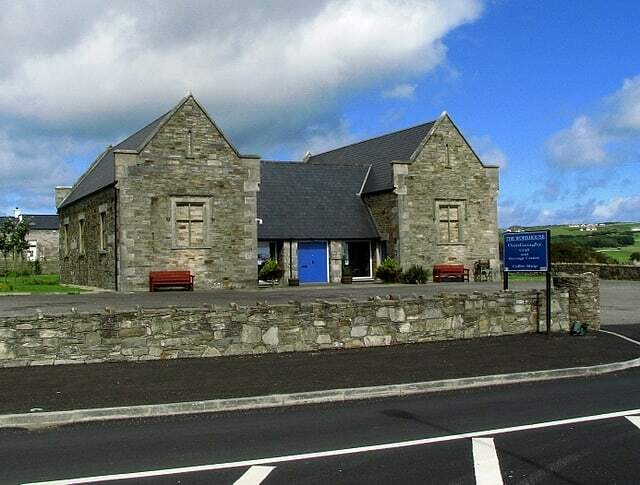 Dunfanaghy Workhouse and Heritage Museum has recently been refurbished and provides informative exhibits on the Great Irish Famine. 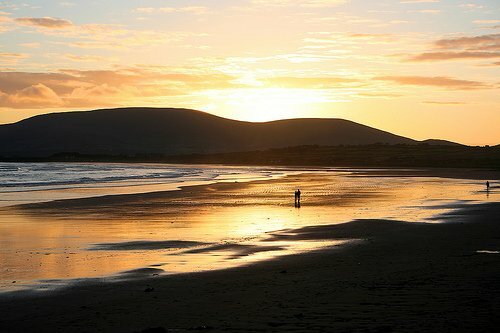 Knockalla beach has been voted one of the most beautiful beaches in the word. 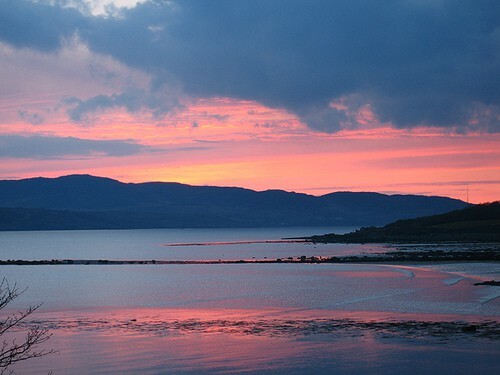 It lies beside the town of Portsalon. 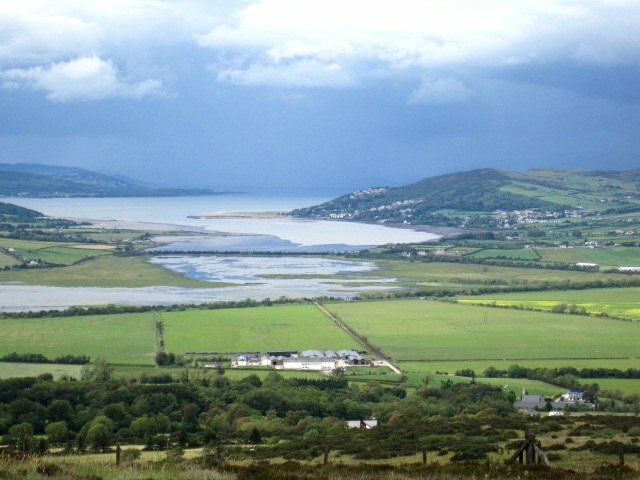 Inishowen is the largest peninsula in all of the island of Ireland. 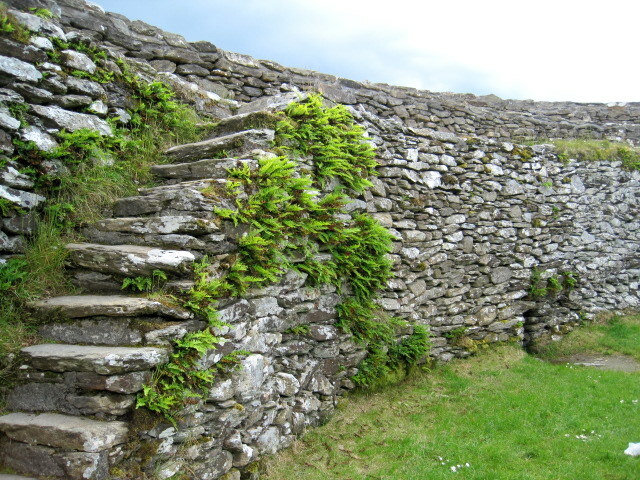 Steeped in history, ancient castle ruins and abandoned stone cottages dot the landscape. Deserted, white, sandy beaches nestle between awe inspiring landscapes of rugged cliffs and spectacular sand dunes. A wide variety of outdoor activities are available such as walking tours, cycling, golf, surfing, deep sea diving, rock climbing and horse riding. 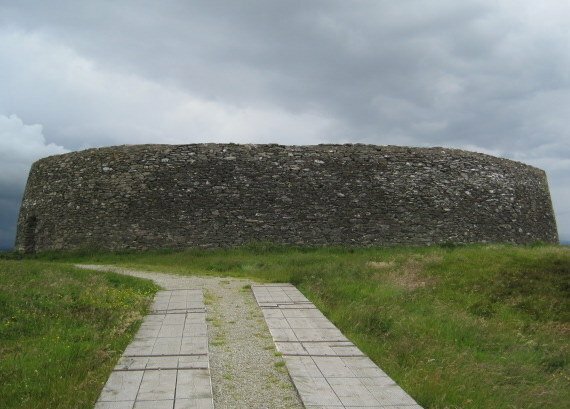 The Grainan Ring Fort stands atop Greenan mountain, close to Donegal’s border with County Derry, as if guarding access to the Inishowen peninsula. 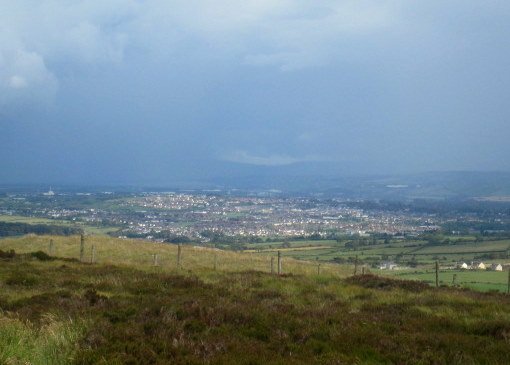 Amazing views of Lough Foyle, Lough Swilly and Derry city await visitors from this blustery, windy hilltop. 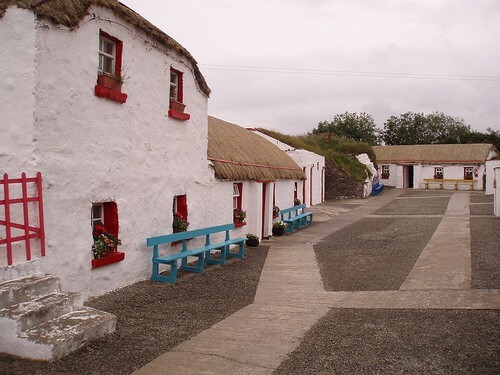 The Doagh Famine Village recreates Irish rural life on the Inishowen peninsula in the times before and after The Great Hunger. 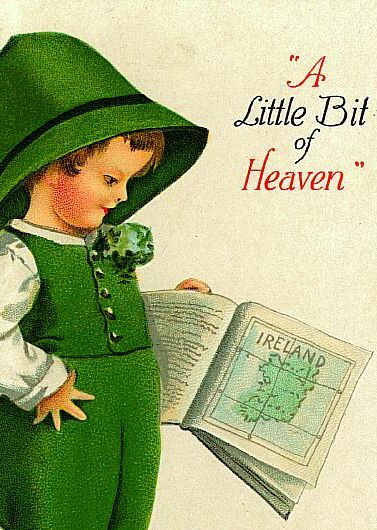 Knowledgeable tour guides provide insightful and entertaining anecdotes to illustrate the nuances of Irish life over the past 150 years. Doagh Strand lies just beside the famine village. Spectacular golden sands border an inlet of the Atlantic ocean. 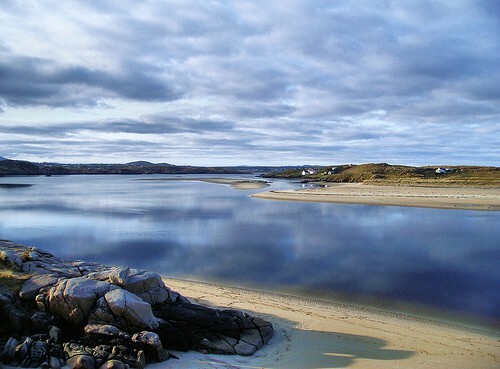 Five Fingers Strand looks across the inlet towards Doagh Strand. 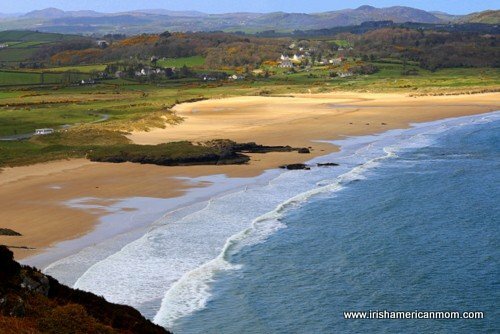 The Inishowen peninsula is home to some of Ireland’s most magnificent beaches. Malin Head is the most northerly projection of Ireland’s rugged, jagged coastline into the Atlantic ocean. 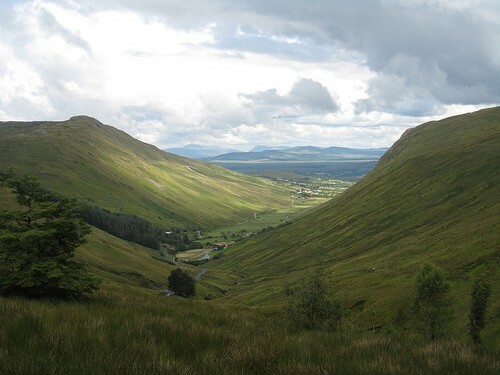 It is renowned as the sunniest place in Ireland and on a clear day the hills of Scotland can be seen to the east. And so, we come to the end of our quick tour of this beautiful county. 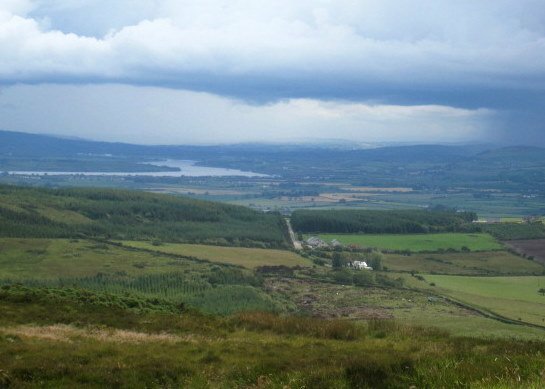 Don’t be fooled by Donegal’s nickname “The Forgotten County”, because once visited you will remember it forever. 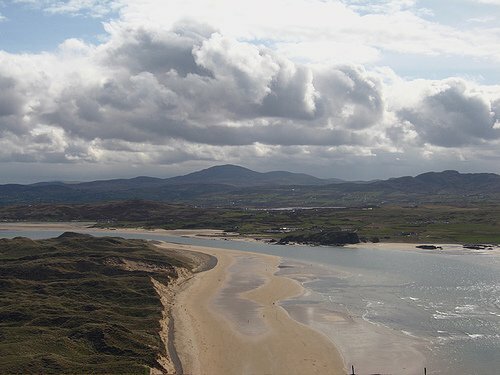 Here are some websites to help plan a trip to County Donegal. Here’s the link for the other counties we have visited so far on our tour of Ireland, county-by-county.